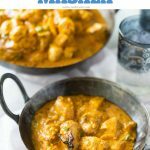 Chicken Tikka Masala is a classic British Indian restaurant recipe that’s not complicated to make and is absolutely delicious! It’s also naturally low carb and Keto friendly coming in at around 6g Net Carbs per serving. 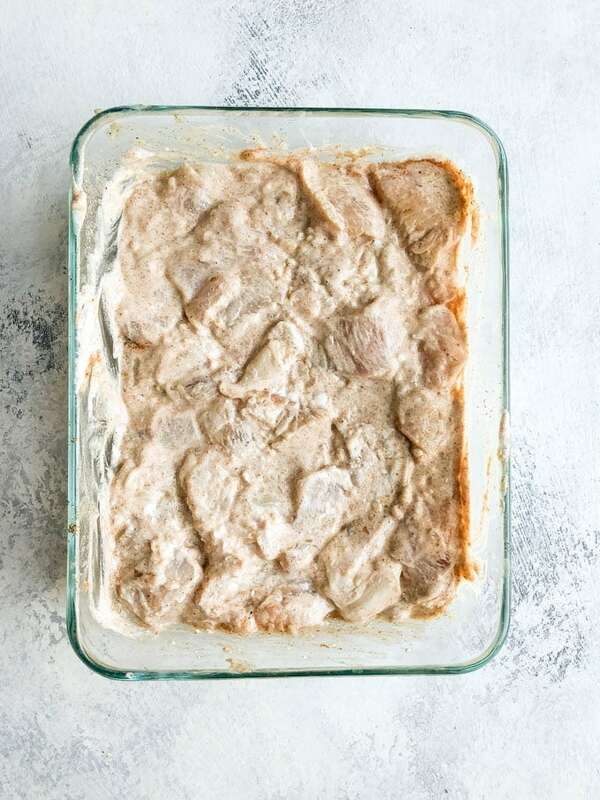 For my Chicken Tikka Masala recipe we’ve added yogurt and lemon juice helps which helps to tenderize the chicken pieces, and the salt, garlic, ginger, and spice marinade help to create a wonderfully aromatic flavor to the finished dish. 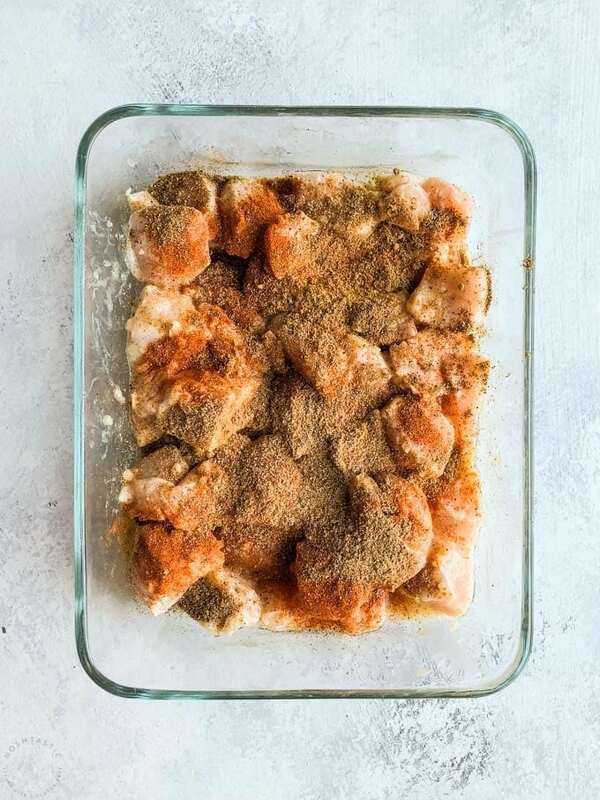 STEP 1 – Start by cutting the chicken into small pieces, then add the salt, lemon juice, mix it all together, cover and put it in the fridge for 30 minutes. 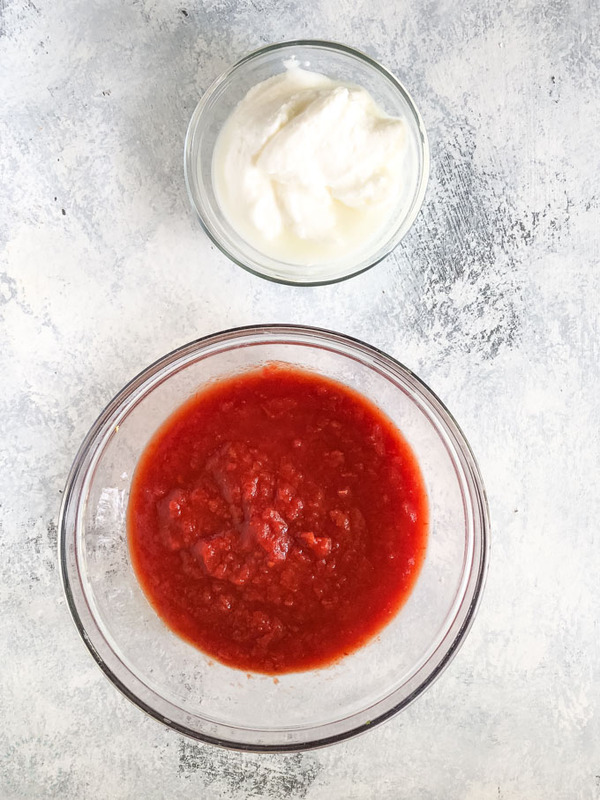 STEP 2 – Puree the fresh ginger and garlic together in a blender or mini food processor then combine it with the yoghurt, spices, and mix it well with the already cut up chicken. STEP 3 – Cover the marinated chicken pieces and refrigerate for at least 6 hours, or overnight. Step 4 – After the marinate time is complete and you are ready to cook the chicken you have two options. You can thread the chicken onto skewers like you see in the picture below. Or, can use a wire rack over a half sheet pan which will keep the chicken from sitting in the juices under the broiler. Step 5 – Broil your chicken tikka about 5 inches from the heat for 4 to 5 minutes per side, turning as needed for about 10-12 minutes total or until chicken is cooked all the way through. Do not overcook or your chicken will dry out. 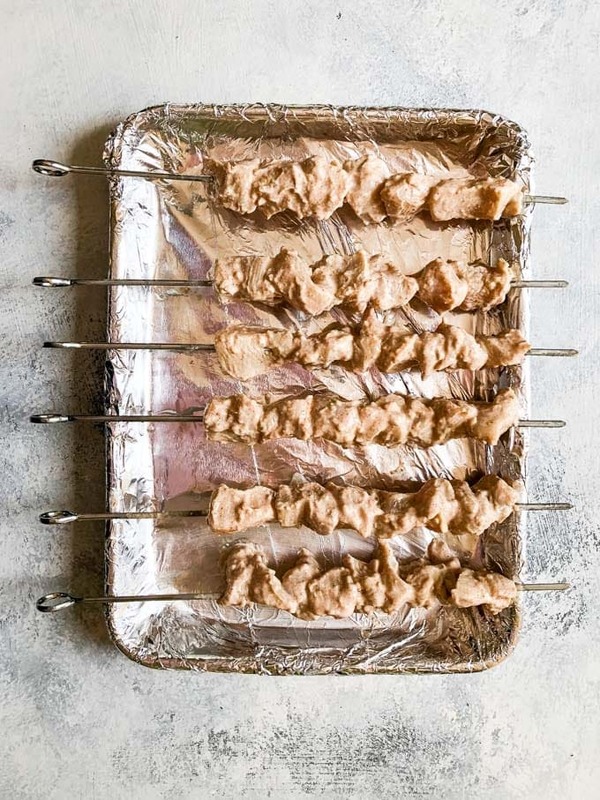 You could also grill chicken tikka skewers over a direct heat for about 4 minutes per side, turning until each side is a little charred around the edges and the chicken is fully cooked. This will take about 8-12 minutes depending on the size of the chicken pieces and the heat of the grill. Step 6 – Heat the oil and add the onions, ginger, and garlic. Fry over a medium heat until they brown a little. Step 7 – Add the ground coriander, turmeric, chilli powder and paprika. Stir for a few seconds, then add a tablespoon of yogurt. stir again, and add the remaining yoghurt in the same manner. Step 8 – Add the tomatoes and the chicken broth, then simmer for 15 – 20 minutes. Then stir in the garam masala. Step 9 – When the chicken skewers are cooked, reheat the sauce and fold in the chicken. Serve immediately. ARE CHICKEN TIKKA AND CHICKEN TIKKA MASALA THE SAME? Chicken Tikka is really just marinated grilled pieces of boneless chicken. 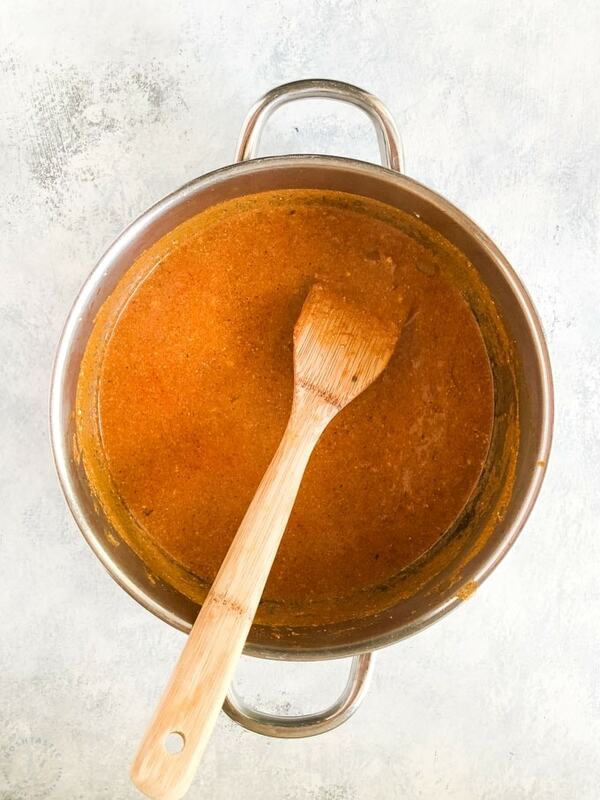 In order to create a Chicken Tikka Masala recipe as we’ve done here, you simply simmer our already grilled pieces of chicken in a masala sauce which is usually made with a spicy tomato based sauce. The short version is that’s there’s very little difference between Tikka Makhani (Butter chicken) and Chicken Tikka Masala. 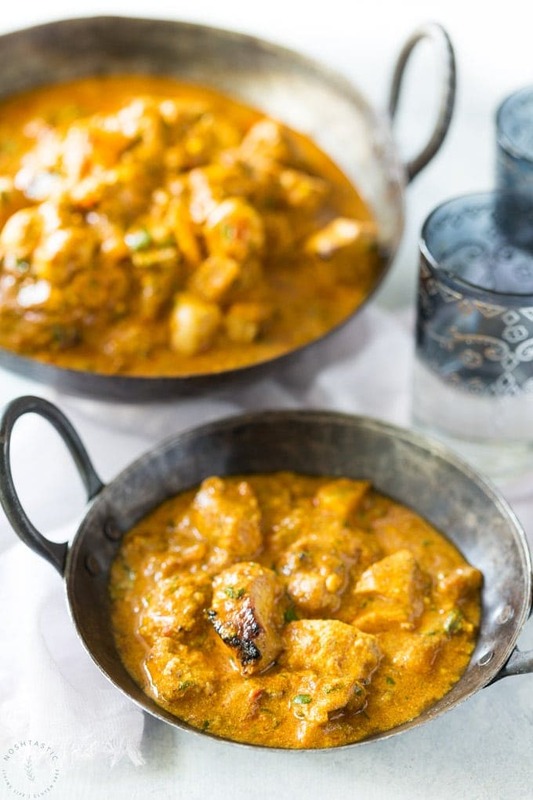 Butter chicken has as the name suggests, butter in the recipe and Chicken Tikka Masala does not. Typically most Chicken Tikka Masala recipes have a sauce that is more tomato based and less creamy, and butter chicken tends to have a more creamy tomato sauce in the finished dish. Is Chicken Tikka Masala Indian? Chicken Tikka Masala is a popular British Indian restaurant recipe. Claims to it’s origins vary with most people suggesting it was first made in Glasgow, Scotland in the Shish Mahal restaurant in the west end of the city. Others dispute that and claim it was created many years earlier in the Punjab, India. What is in Chicken tikka masala spice? Chicken Tikka Masala spice mix usually contains garlic, salt, pepper, cumin, paprika, coriander, and Garam Masala. 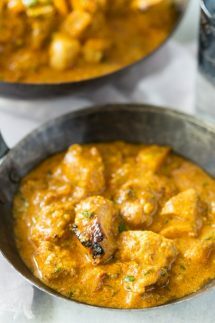 Low Carb & Keto friendly Chicken Tikka Masala is easy to make, full of fresh healthy flavors, a great Indian Restaurant recipe to make at home, very similar recipe to butter chicken. 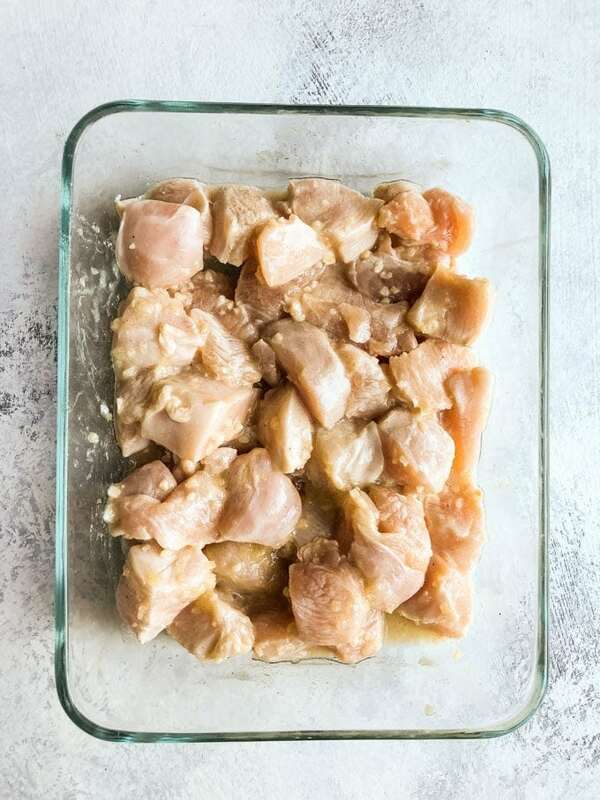 Cut the chicken into 1 inch sized chunks and place in a bowl or ziplock bag for marinating. Add the salt and lemon juice and let the chicken sit in that for 30 minutes in the fridge. Finely chop or puree the fresh ginger and garlic together in a blender. Add the yoghurt and spices to the garlic ginger mixture and then add it to the chicken pieces, mix well to combine. Marinade for 6 hours or overnight. Broil the marinated chicken pieces about 5 inches from the heat for 4-5 minutes per side, turning as needed for about 10-12 minutes total or until chicken is cooked all the way through. Brush the hot grill grates with a little oil. Cook the marinated chicken pieces over direct heat for about 4 minutes per side, turning until each side is charred and the chicken is fully cooked, will take 8-12 minutes. Add olive oil into a large pan over a medium-high heat. Then add the onions to the hot oil. Gently fry until they are a little brown which will take about for 6-7 minutes. Now add the ginger and garlic and continue to fry, stirring for just a minute. Add the ground coriander, turmeric, chili powder and paprika to the onion. Stir for 10 seconds, then add a tablespoon of yogurt. Stir and cook for a minute or two, then add the remaining yogurt in this way, a tablespoon at a time. Add the crushed tomatoes and cook on a medium low heat for 5 minutes. Add the gluten free chicken broth and bring to a simmer. Reduce the heat to low, and simmer gently for 10-15 minutes or until the sauce thickens. Stir in the garam masala, taste and add more salt if you need it. Shortly before you are ready eat, preheat the grill or broiler. When the chicken is cooked, rewarm the sauce and stir in the chicken. Garnish with cilantro leaves and serve immediately. 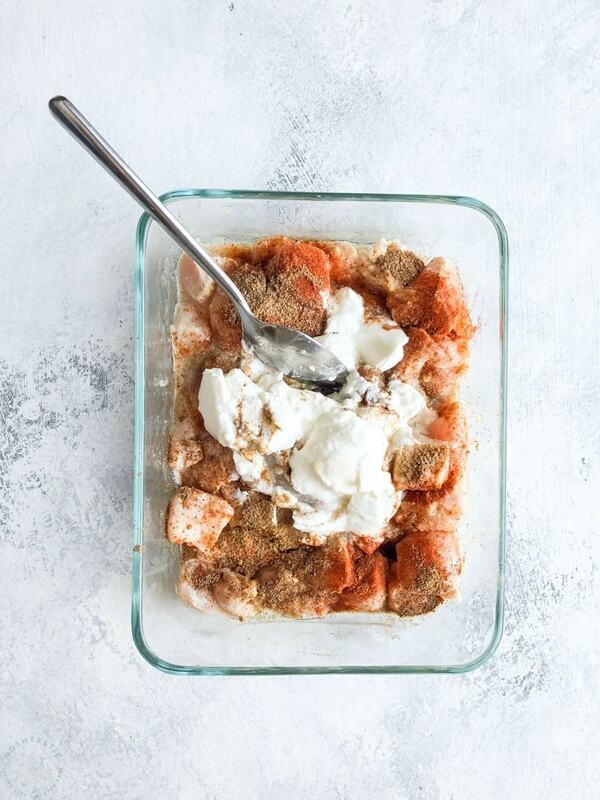 This recipe contains approximately 6g net carbs. 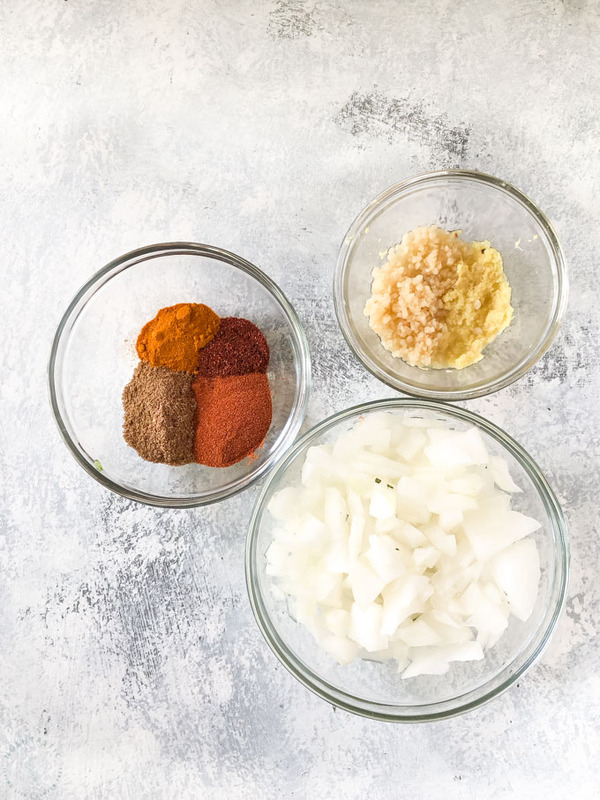 Most of the carbs come from the onions and garlic so if you want to reduce the carb count further you could also reduce those ingredients but that may be detrimental to the final outcome of the recipe as it relies on those ingredients for flavor.